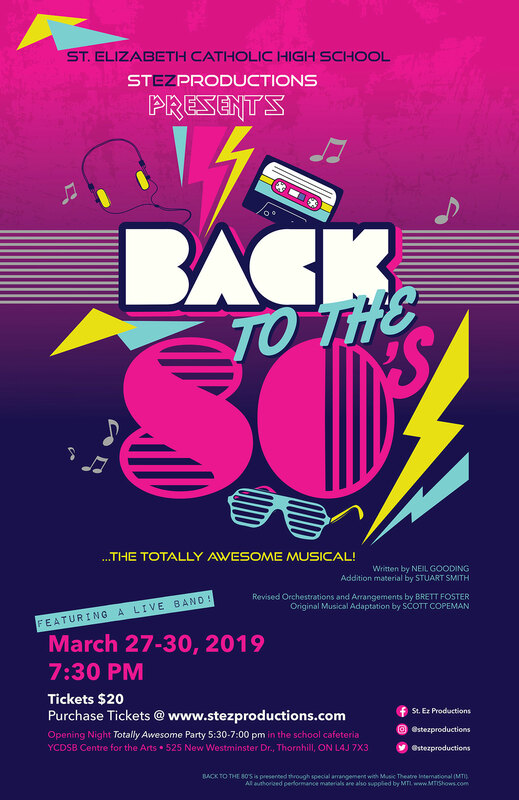 Join the class of 1985 as they experience the fun and heartbreak of growing up in a totally awesome decade! FOR OTHER SHOW DATES, CLICK HERE OR SEE THE BOTTOM OF THIS PAGE. What are my transportation/parking options for getting to and from the show? If you're taking transit, the YCDSB Centre for the Arts is located a short 5 minute walk away from the Promenade Terminal, serving York Region Transit, Viva, and TTC routes. For those driving, there will be plenty of free parking in the north theatre lot. Yes. Please email stezproductions@ycdsb.ca after purchasing your ticket if you need accessible seating. Can I pay for tickets in cash? Cash sales are only available in person, at the school. During school hours, tickets are on sale during lunches outside the cafeteria. Special arrangements can also be made by emailing stezproductions@ycdsb.ca. Flash photography is not permitted during the show. No food or drink is permitted in the theatre, although refreshments will be available in the lobby during intermission. Not necessarily. You do need to show your tickets at the door, but printing the ticket emailed to you is just one option. You can also show an electronic ticket on your phone with the Eventbrite App (iOS and Android) or download it to your Apple Wallet. You can contact the school by telephone at (905) 882-1460 or by email at stezproductions@ycdsb.ca.